I’ve been playing tennis since I was twelve, so I always enjoy seeing rackets in portraits, even when they’re just props. This photobooth portrait is wonderful. I love the combination of a child’s racket with palm trees and pyramids. 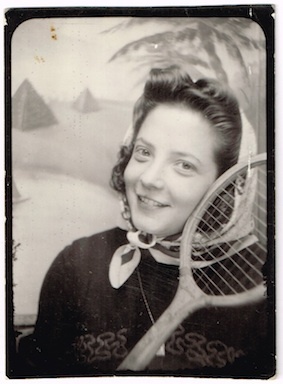 I adore the fact that this young lady thought to take her tennis racket into a photobooth! I’ve never seen another booth photo that memorialises a sport in this way. The background is interesting for its Egyptian theme of palm trees and pyramids. This is also something I haven’t seen before. In faded handwriting on the back are these words. 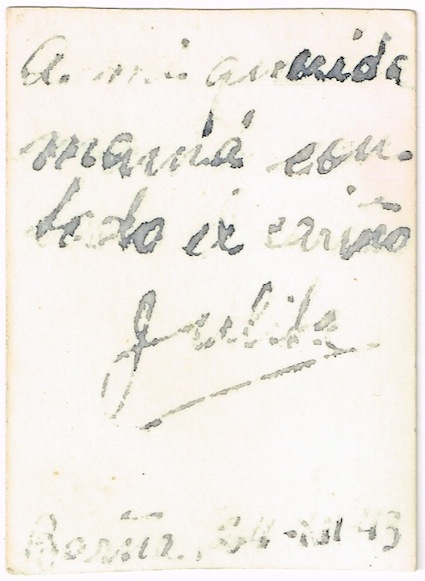 . .
My Spanish is good enough to make out some of the script on the back of this pic, but I am hoping someone out there might confirm that I have it right, or tell me where I have gone wrong! The information on the bottom is too faded for me to make sense of. I am assuming it is a place-name and a date, 1945 being part of it? It’s crazy and adorable. I love the Egyptian backdrop, and I’m more than impressed that you can make out the inscription on the back. The handwriting and the fading make it so hard! Kudos to Kate! She studied Spanish in Guatemala. I don’t know Spanish at all, so it would have been a struggle for me. I think the year may be 1943 rather than 1945. You have a great memory, Brad! Thanks so much for the reblog! I didn’t know that this is a child’s racquet. Didn’t know they existed at all.